The ballroom by the time the clock struck twelve was already full with laughter behind the masks and fizzing sounds of champagne. Behind the masks were people of most different agendas - spies, perhaps - but the masks kept their secrets safe, as tonight everyone could be anyone they want. As if their usual masks of powdered face were not enough. 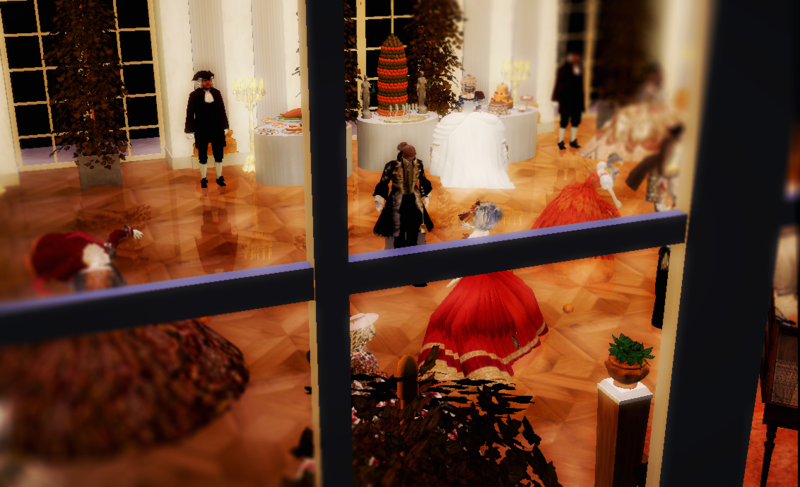 As more and more guests arrived to the palace and more and more greeted each other and paid respects to the already present Queen of Prussia there was puzzlement over where the host - His majesty Frederich II - was? It was until the moment the formerly 'infamous' Baroness von Essen whispered news in a hurry to Her Majesty that the answers were given. Her Majesty stood up and upon asking for everyone's attention announced: "His Majesty unfortunately cannot attend this masquerade due to official affairs that he hurriedly needs to attend to." 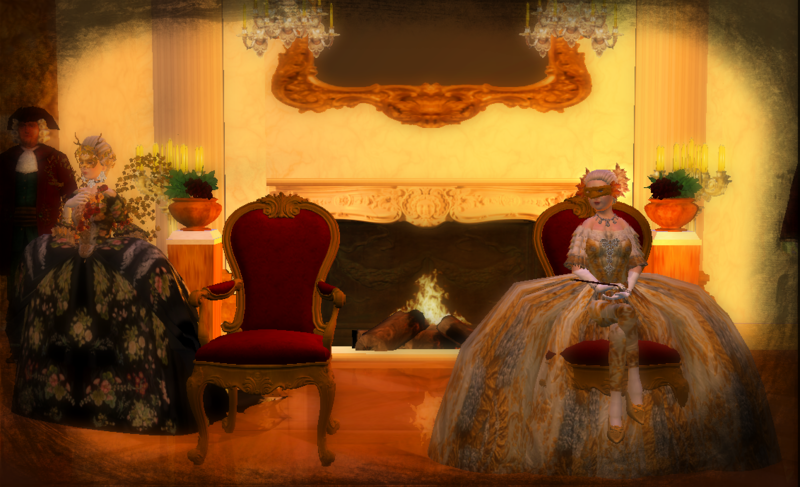 Her Majesty sighed knowing that His Majesty yet again abandoned her to host the courtly events in Berlin while he prefers to stay in his Sanssouci residence. So much of a long-anticipated (one-sidedly) meeting! The masquerade still carried on disregarding anyone's feelings. It was a merry evening full of dancing and laughing, as the boundaries between good and bad were so thin thanks to the masks. 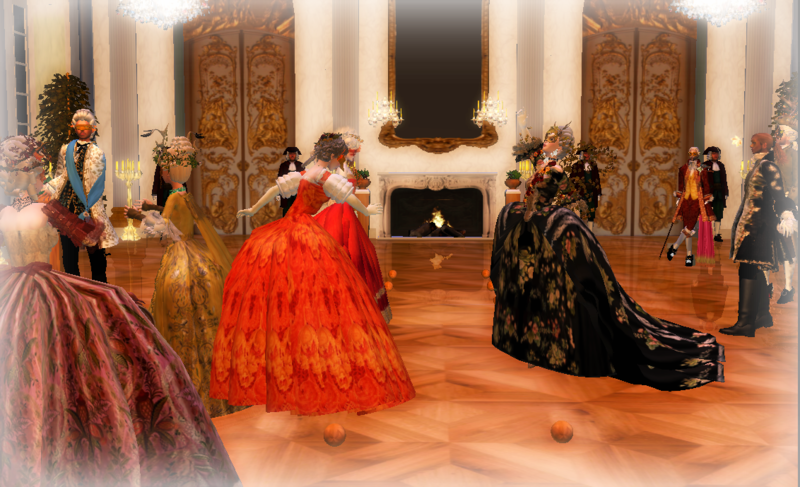 Her Royal Highness Princess Amalia was found scandalous dancing and enjoying female company for a dance. Furthermore, the Princess decided to occupy the King's seat as her own in his absence. Well, he was not there, was he? Grafin von Polentz who attended to the Queen that evening showed clear hostility towards the Baroness who recently got cleared of false charges of treason. The two have been old enemies for a long time now. What an irony that they both wore dresses tailored from same fabric. 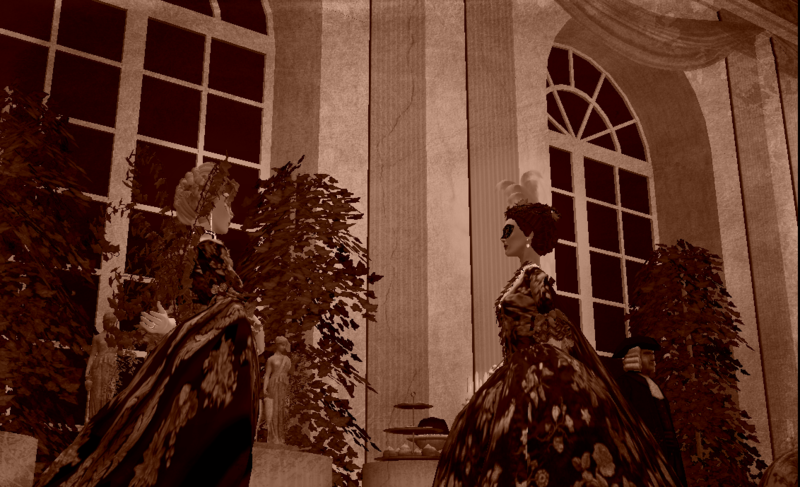 The masked ball was concluded with the last dance between her Majesty the Queen dressed as Demeter Goddess of harvest and masked Herr von Haugwitz from the King's household. The Queen was seen heavily breathing, as she was sure not in "right form" to dance coupled by the fact that it was a really long time since she last danced with anyone, especially her own husband King Frederick II. It was now time to announce the winners of the contest among ladies and gentlemen. The winners were the ever beautiful Claudia d'Orleans from France (travelling incognito) and the flamboyant Frenchman Louis-Charles de Beauvoir, Marquis de Chagny for their gorgeous autumn deer costumes. It seems deer antlers bring luck, indeed, as we found out that evening. Now the 'formal' part of the evening was over. What happened will stay between those who were present that night. Princess Amalia sat down on her chair and slowly rested her head on its back. She showed expression of relief - of course, as it was time that light was shed to the truth behind everything. Apparently, the rumours about Austrian conspiracy against His Majesty Frederick II were born in the salon of a certain Madam von Rochzen in Berlin. It seems one of the guests, Austrian unsurprisingly, being drunk late in the night, shouted that the King would pay for stealing Silesia from Austria. Investigations showed that he used to govern the region but lost his position after Silesia became part of Prussia. The guests that evening most likely over-exaggerated the whole event but the impact was made - all of Berlin by next morning was talking about possible assassination of King Frederick II. The poisoning of the Kings youngest sister Anna-Amalia at Baroness von Essens house was no part of any conspiracy either. In fact, it was a simple accident due to carelessness of one commoner. The royal investigation squad after questioning all the Baroness servants and Baroness herself found out that one of the newly recruited maids accidentally switched ingredients in the dreaded drink right before the event thinking she forgot to add sugar. Who adds salt and then accidentally pours vinegar into cranberry juice, Mesdames and Monsieurs? But surely the maid was too afraid to replace the juice, as there was no time to. After the Baroness was freed from house arrest and her name was cleared with Kings pardon, she fired the maid. The newspapers, closely controlled by the government, also ensured the Prussian citizens that there should be no fear for their King and that people involved in the incident, or better said, accident were completely innocent. The King gave no clear comment on the matter but, in the least, he was seen enraged by all the fuss created from "mere" rumours. It is also known that he considered the rumours from the very beginning just a drunk man's bluff, which, indeed, turned out to be so in the end. P.S. Thank you everyone for following on this mini-story line "Austrian Conspiracy". I hope you enjoyed it and, perhaps, there will be more stories to tell of the Sanssouci Court to you all. Best wishes, Sanssouci Team. 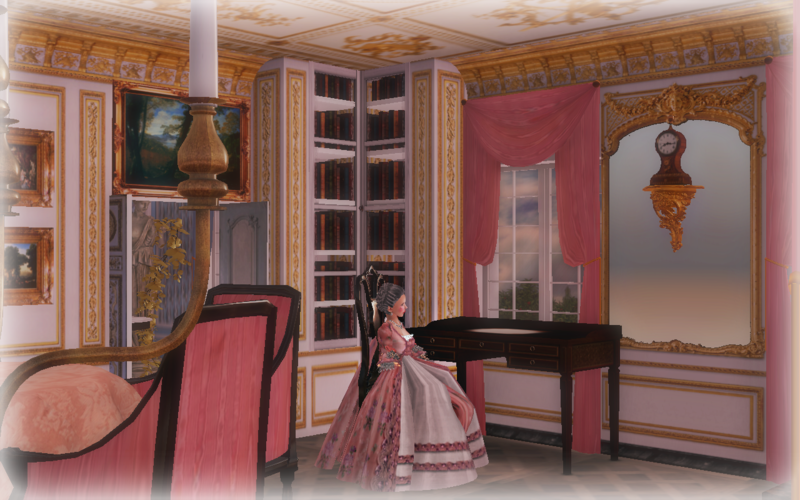 beautiful locations provided by Sanssouci Roleplay and built by tjay007. Textures provided by HHDoctorRaven (purchased and/or made). The extent of people buzzing around Berlin regarding the assassination rumours was at its highest by the 3rd week of August, 1763. It was apparent - there were much more guards making rounds around Berlin and Potsdam checking on anything suspicious. Plus, entry into the country was much more strictly regulated. It was in this period that something completely unthought for happened. 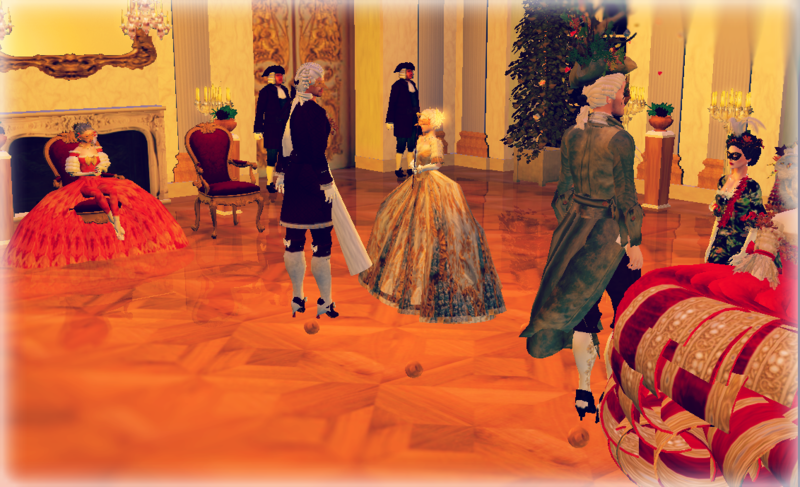 It all started with a merry evening in Potsdam. 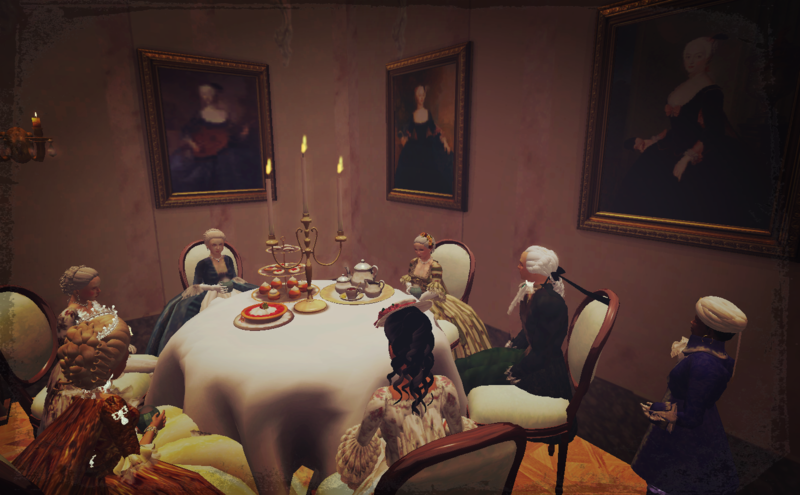 Baroness von Essen invited several of her friends and even the King's sister Her Royal Highness Princess Amalia. It was delightful evening with champagne and poker chips flowing around the gaming table like butterflies. Princess Amalia found delight in playing billiard with a certain French Marquise while the rest of the guests preferred cards. 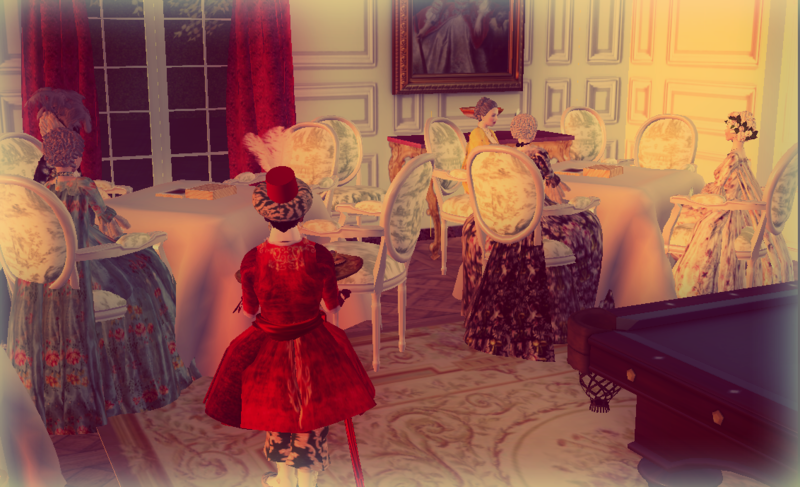 The evening was well accompanied by a pleasant summer breeze that passed in and out of the room through the open doors. Then the unthinkable happened. The witnesses, later interrogated, recalled the Baroness offering a "refreshing drink" to Her Royal Highness and just another ordinary maid poured the drink into the glass and offered it to the Princess via a serving tray. A moment later, the Princess complained about feeling dizzy and immediately dropped to the ground unconscious. Everyone panicked. The moor that was present there quickly grabbed some smelling salt, as the hostess shouted to the servants to quickly get water and the doctor for the Princess and at the same time tried to wipe unknown liquid from the Princess' mouth. "She was poisoned!" 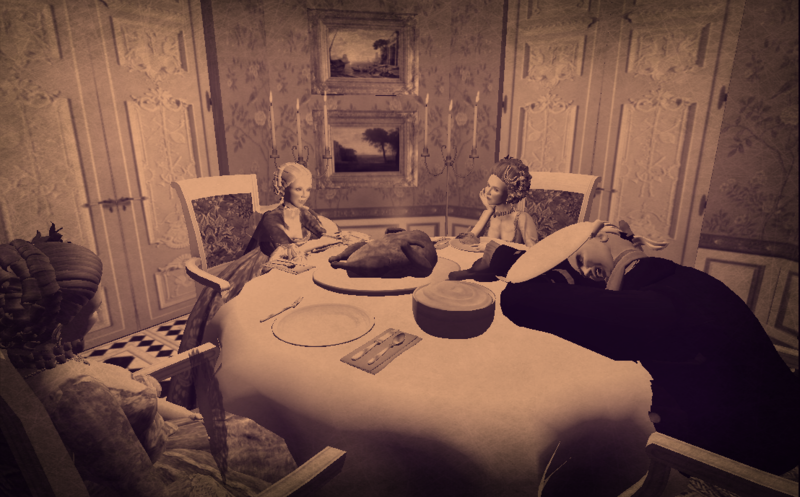 - the baroness shouted calling on the guards to catch the maid for later interrogation. 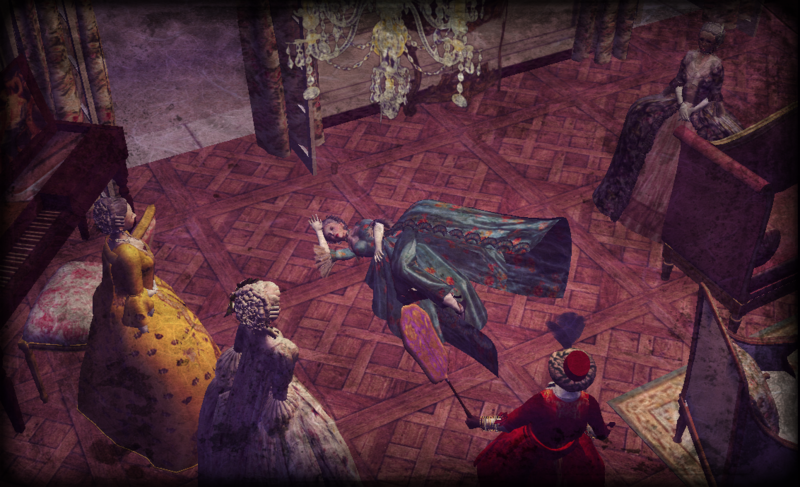 The Princess was then carefully carried into the music salon to rest on the sofa until she regains consciousness. The atmosphere was really gloomy and the guests, unwilling to be in any way related to the incident, excused their leave in any ways possible. Upon regaining consciousness several hours later, the Princess, being in a delicate condition, used a servant as the "bucket". After some more time Princess Amalia, feeling like she could go home now, furious and frustrated from such disgrace, stomped out of the Baroness' house swearing to catch the one responsible for this. The pamphlets boomed after this incident, most of which blamed Austrians, however, there was large number blaming the Baroness herself, as they claimed that she had grudge against the royal family and that she was an Austrian spy. The Baroness' reputation was in tatters by this point. Currently, the Baroness is under house arrest until proper investigation is carried out and the culprit is caught and punished. The Baroness at the same time tries to convince everyone that she' innocent, as she claims that she tried the drink beforehand suffering no damage whatsoever. But who knows? Perhaps, it really was part of Austrian assassination plot. Maybe the Baroness was set up? Or is the Baroness guilty? 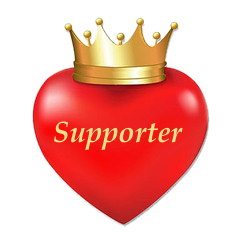 Could there possibly those those who hold certain grudge against the royal family inside the country? Will the truth be found out? Only time will tell. Berlin has been in unrest for the last week. Whispers were everywhere in Berlin and probably even beyond it. By now, rumours have probably spread all over Prussia including Potsdam and Sanssouci. These were no ordinary rumours, as they involved the Prussian King Frederick II. People are shaken by possible Austrian assassination plot on His Majesty King Frederick II. Rumours say that the Austrians in Berlin were heard to have shouted that the King will pay for stealing Silesia from their motherland. Of course such rumours would cause uproar, as they seemed to be the truth - Austria was not happy at all to have been deceived by Prussia losing the Seven Years War and the rich lands of Silesia in the process. The first mention of the rumours in the royal court was made by a certain Baroness von Essen during one of the Queen's salons at her summer palace Schonhausen, Berlin. At that point, Sanssouci has already increased their guard to protect the King in case of assassination attempt. Upon the mention of the rumours, the Queen seemed completely shocked, as she wasn't informed by any member of the royal family even though she lived near Berlin. The whispering couriers at the gathering guessed that the King probably forgot again that he even had a wife to begin with. Some courtiers who have recently arrived from Potsdam assured the Queen that the guards were already very cautious of the situation monitoring the grounds and reporting anything suspicious. Even Princess Amalia, one of the few friends the Queen had in Prussia, was there in Sanssouci in case there was an conspiracy against the King. It is still very unclear on the situation as no Austrian spies were yet caught. Prussia's neighbours such as Austria has not said anything at all on the matter preferring to stay silent to avoid any kind of misinterpretation and conflict. After all, Austria needed to restore itself after losing the war. Whatever may be behind these rumours, it certainly caused uproar around Prussia and ended the salon rather quickly as the Queen could no longer act as a proper host to the guests.